And sometimes one's attention is mainly drawn to how the road overcomes the obstacles of an extreme landscape. 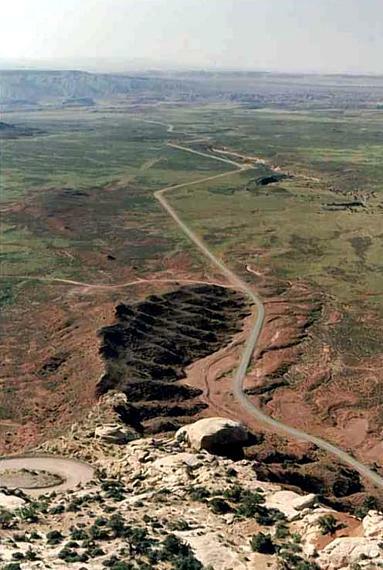 In southeastern Utah, immense and open San Juan County, one travels along a state highway from Medicine Hat, and one sees a very high plateau ahead. One knows from the map that it is required to get up to the top, but it seems impossible. Then one twists some incredible twists and climbs, and then it has happened, after many moments -- the car has come from down below, and one is now very high above, and there are many splendors ahead. But first one must look back, and marvel.